While being known best for shopping and eating, we discovered that Palermo had a lot more to offer. The beautiful neighborhoods of Palermo Viejo and Palermo Hollywood are clean, quiet escapes from the downtown areas of the city, and boast expansive parks, museums and outdoor attractions. Parque 3 de Febrero: Even though the Botanical Garden and the Zoo are just a short walk from the Plaza Italia Subte stop where we got off, we decided to walk a bit further and check out Parque 3 de Febrero. We were excited to find paddle boat rentals for use in the pond, wide open picnic areas and great paths for walking or running around the park. Planetario Galileo Galilei: Also within Parque 3 de Febrero, is the Galileo Galilei Planetarium. It's website lists tons of exhibits on astronomical discoveries and Galileo himself, but unfortunately normal activities were closed for renovations when we visited. Although, last week they did reopen night-time viewings of space through telescopes. Parque las Heras: Across the street from the Planetarium is the Club de los Amigos which we haven't tried yet, but heard it offers day passes for swimming and other outdoor activities. We walked instead to the Parque las Heras which has several futbol fields, chair and umbrella rentals, sprinklers to cool down sunbathers and plenty of trees to lie under. For refreshment, there are plenty of kiosks within and around the park that offer fresh squeezed juices, sodas and beers. 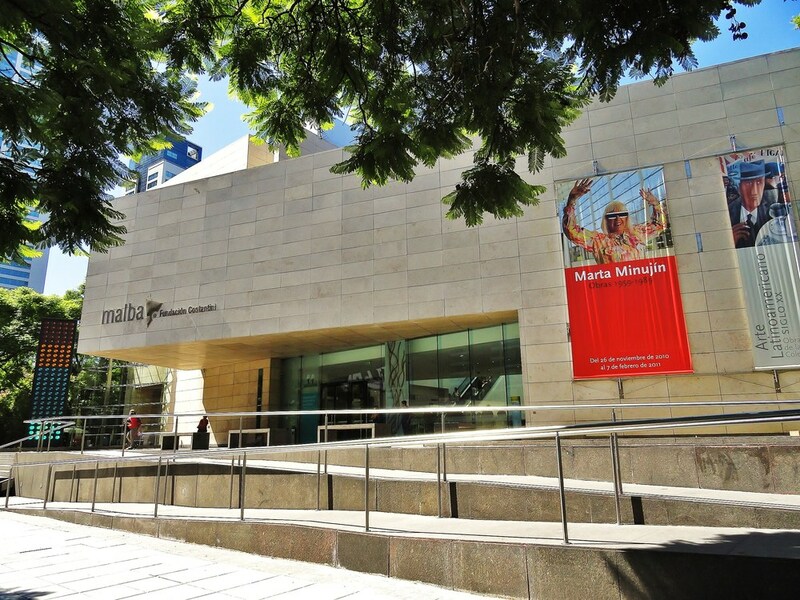 MALBA: Since we were just a few block south of the Museo de Arte Latinoamericano de Buenos Aires (MALBA) we decided to get out of the late-afternoon sun and take a look. It houses a great collection of contemporary works from Latin American artists, but during our visit, the museum was showcasing 30 years of conceptual artist Marta Minujin's work. *Note: Contrary to many guidebooks, admission on Wednesdays IS NOT free for everyone. It is only free for students with a valid international student ID card and is $10AR for an adult pass. Tango at La Viruta: Since it was mentioned as a favorite by Tim Ferriss, author of The 4-Hour Workweek, we thought it would be fun to take our first class here. It was $25 AR to enter and attend all the days classes, so we started with the beginners Tango class at 7pm, then stayed on for the Salsa class. We finished the night trying out our new moves amongst 20-70 year old dancers and drinking Fernet and Coke.